Hardy and Littlewood conjectured that certain quadratics produce prime numbers more often than would be expected of random numbers of the same size. For example the quadratic 4x2 - 2x + 41 produces prime numbers for all values of x from 1 to 22. And for larger values of x the value is also often a prime. 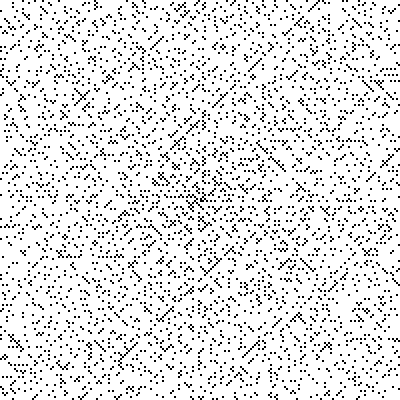 This quadratic is related to the image to the right, showing the Ulam spiral of primes. One of the diagonal lines in this image represents primes generated by the quadratic given above. You can use this page to try quadratics of your own, and compare them to 4x2 - 2x + 41. Enter the values of the coefficents into the boxes. Choose a value of n (up to 5000). The quadratic will be evaulated for values of x from 1 to n. Click "submit". The output will show the percentage of primes generated by your quadratic, compared with the percentage generated by 4x2 - 2x + 41.